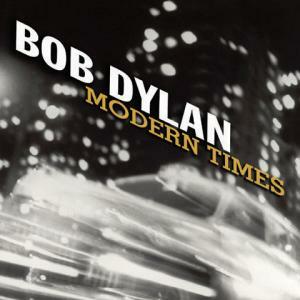 Bob Dylan has just released a new album, but I’m behind the times, and have only recently completed my review of his previous album, Modern Times (2006). Two years late, but here it is. — I could do either of these things, thereby render a useful review of the album, and spare the reader my further cogitations. But what fun would that be? Then we have Bob Dylan, who may go down as one of the greatest 20th century practitioners of that language. Few have influenced a language as Bob Dylan influenced American of the late 20th century. Phrases from his songs, like Hobbits, have a way of turning up in the most unlikely of places. I’ll not soon forget when a rural North Carolina sheriff, in the midst of a press conference on a missing woman, likely murdered, reached for some way to convey his department’s perseverance in investigating the crime — and, stammering, settled on a Dylan quotation: “we’ve got to just keep on keepin’ on.” The man was not gifted at impromptu public speaking, but he did manage to convey his meaning. More recently, in a dissenting opinion, none other than Chief Justice John Roberts of the United States Supreme Court quoted (page 36) Dylan’s most famous song. Furthermore, Dylan’s innovations in the American language — drawn, of course from idiolects as varied as the upper Midwest and the Deep South — track very nicely with Mencken’s appraisal of what makes the language great and unique. Observe. After a careful and occasionally acerbic survey of the state of the literature on the distinctively American branch of the English tree, Mencken renders this judgment: “The American, from the beginning, has been the most ardent of recorded rhetoricians. His politics bristles with pungent epithets; his whole history has been bedizened with tall talk; his fundamental institutions rest as much upon brilliant phrases as upon logical ideas. And in small things as in large he exercises continually an incomparable capacity for projecting hidden and often fantastic relationships into arresting parts of speech.” As an example, Mencken adduces the word rubberneck, which as a synonym for gawker or tourist, someone who cranes his neck grotesquely, really does show some flare. This word is, according to him, “almost a complete treatise on American psychology; it reveals the national habit of mind more clearly than any labored inquiry could ever reveal it.” He continues, with the thrilled delight that is so infectious throughout his fine book: “The same qualities are in rough-house, water-wagon, near-silk, has-been, lame-duck and a thousand other such racy substantives, and in all the great stock of native verbs and adjectives. There is, indeed, but a shadowy boundary in these new coinages between the various parts of speech.” More examples: “Corral, borrowed from the Spanish, immediately becomes a verb and the father of an adjective. Bust, carved out of burst, erects itself into a noun. Bum, coming by way of an earlier bummer from the German bummler, becomes noun, adjective, verb and adverb.” And on and on it goes. Now in a certain sense it would be impossible to demonstrate how neatly this description dovetails with Bob Dylan’s use of American. Songs are meant to be sung and heard, and only secondarily written about, if at all. So I am left merely (a) to assert my belief that when Mencken writes thusly of the American language, he describes Dylan’s lyrical art with remarkable accuracy; and (b) to sketch a suggestion of the evidence that would support it, relying on the interested reader’s knowledge of Dylan, or desire to gain that knowledge, to provide their own demonstration. The sketch will, naturally enough, be drawn mostly from the album under consideration here, Modern Times. Bob Dylan has often excelled at narrative songs — vague and hazy stories of squalor, folly and crime, usually told first person. “Just Like Tom Thumb’s Blues,” or “Lily, Rosemary and the Jack of Hearts,” or even “I Shall be Free.” Frequently these narratives have evidenced a detectible regional character: they take place in, or move between, the Southwest, or the deep South, or the upper Midwest. The Blues Highway, from New Orleans to Minnesota, has been a fixture in a number of songs. They are so boldly and marvelously American, many of these songs! Mencken would not fail to discern it. Dylan would go on to hurl many scornful polemics at the generation with the mattress on its bottle of wine, the 1960s, as at many targets. Then, the bitterest cut; he would consummate his defiance of the 60s by releasing in the year 1968 an album of simple country songs, of sincerity and regret, which uttered hardly a word about war. But I fancy what really turned him against the 60s was their anti-patriotism. They found America in a basic sense hateful. He could never accept that. Even as a Leftist Bob Dylan was a particularist, which is the first and most vital step in patriotism. He could never hate his particular native land. And when the system or philosophy of the 60s got done with its platitudes and abstractions and parties, it was going to destroy America. It may still yet. But the man who is sometimes foolishly said to have put this system to song, very certainly repudiated it. He repudiated it with the same sneers by which it was made. Now that, I venture, is experimentation, hospitality to novelty, and carelessness of precedent which Mencken could appreciate. Two patriots: the scholar and the bard. Mencken, the elitist, unexpectedly found his love of democracy in the language of his native land. Dylan, meanwhile, demonstrated the democracy of his native land by his irrefragable love for her. How else is Bob Dylan a true American in his songs and performances? It is, of course, the very thing that, however experimental, open to novelty and scornful of precedent it may in a given era appear, shall evermore antagonize enlightened society in the West: his quite plain grounding in religion, even Old Testament religion. Nothing is less “cool” in urban fashionable and enlightened society than orthodox biblical religion. Nothing, therefore, so distressed, bewildered and annoyed the society which accumulated around Bob Dylan and his music, than his very public conversion to Christianity. But even then he could not be ignored. Only a fool (or someone narrow enough to judge only on the evangelism of its lyrics) could deny the greatness of, for instance, Slow Train Coming (1979). Now and then an attentive reader will hear it reported that Dylan has repudiated his Christian faith. I recall reading it asserted that he, while still spiritual, professes no “organized religion.” Ah the platitudes of modern argot! In truth the language of biblical Christianity has pervaded most of his lyrics — even before his public conversion. Let someone argue that “Gates of Eden” or “Shelter from the Storm” is innocent of Christian influence. In Modern Times the influence is abundant, both open and subtle. Dylan has of course been hugely influential, and "Tangled" is a fine song, but I don't think he can be given credit for the phrase "keep on keeping on." I'm not sure how long the phrase has been in wide use, but the great Curtis Mayfield had a song that didn't only use the phrase, but for which that phrase was the title, and this was several years before Dylan's song. '71 I think. There's a '72 performance of it by Mayfield on youtube. Easy to find by a youtube search. (I'd give the link but that often seems to make comments not appear). It was also used, I recall, in an extremely popular Isley Brothers song -- that "Who's that Lady?" song - though I'm not sure that's the title -- from quite early in the 70s, I believe. In this matter Zimmy was following, not leading, the crowd.